Bold, front facing gables, arched windows, and a substantial dormer establish an impressive exterior for this four bedroom traditional. The vaulted great room features a rear wall of windows, a fireplace, access to the back porch, and a rear clerestory dormer window. The kitchen is designed for efficiency and enjoys a convenient pass-thru to the great room. 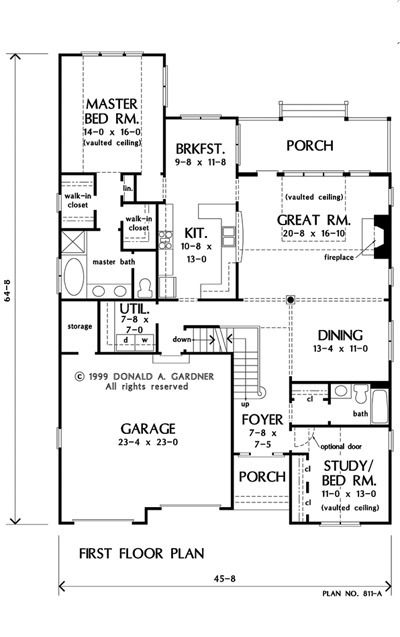 A smart layout creates privacy for all four of the home's bedrooms. The master suite is secluded at the back of the home and boasts a vaulted ceiling, his and her walk-in closets, and a well-appointed bath. 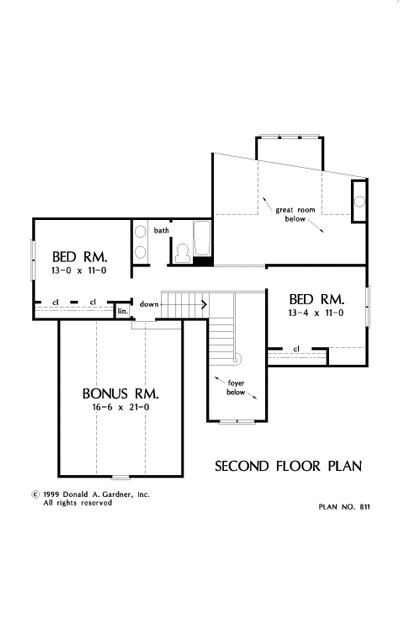 A study/bedroom is located at the front of the home, and two more bedrooms can be found upstairs. A generous bonus room adds flexibility and potential extra living space. 1st Floor: 1856 Sq. Ft. 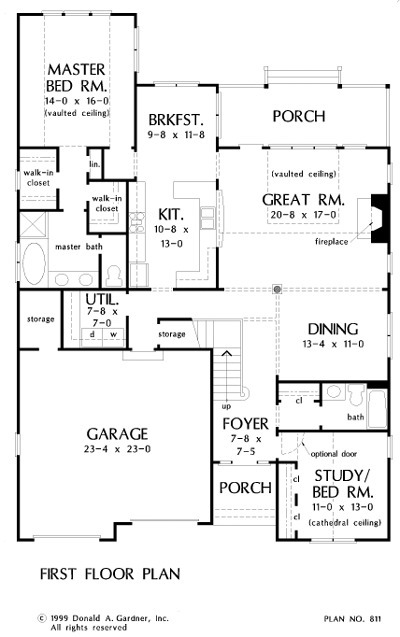 Bonus Room: 366 Sq. Ft.
House Dimensions: 45' 8" x 64' 8"
Great Room: 20' 8" x 16' 10"
Foyer (Cathedral): 7' 8" x 7' 5" x 18' 1"
Dining Room : 13' 4" x 11' 0" x 9' 0"
Great Room (Vaulted): 20' 8" x 16' 10" x 18' 1"
Kitchen : 10' 8" x 13' 0" x 9' 0"
Breakfast Room : 9' 8" x 11' 8" x 9' 0"
Utility Room : 7' 8" x 7' 0" x 9' 0"
Bonus Room (Vaulted): 16' 6" x 21' 0" x 9' 4"
Garage : 23' 4" x 23' 0" x 0' 0"
Garage Storage : 5' 0" x 7' 0" x 0' 0"
Master Bedroom (Vaulted): 14' 0" x 16' 0" x 12' 8"
Bedroom / Study (Vaulted): 11' 0" x 13' 0" x 13' 4"
Bedroom #3 : 13' 0" x 11' 0" x 8' 0"
Bedroom #4 : 13' 4" x 11' 0" x 8' 0"
Porch - Front : 7' 8" x 6' 6" x 0' 0"
Porch - Rear : 21' 0" x 7' 8" x 0' 0"
Balcony : 7' 0" x 4' 0" x 8' 0"
Storage (Other) : 9' 10" x 3' 4" x 0' 0"